I have never thought I would make koozh Vadam/Vathal in Bangalore. This year Bangalore’s weather is equally hot to Salem. So I told my MIL to make Vengaya Vadagam and killu vadam for me. Last year when I posted Arisi Koozh Vathal recipe, I had mentioned about my mom’s Killu vadam recipe using leftover rice. Before marriage, I have helped my aachi & mom to make this killu vadam. She makes in lots and store for months together. Its a very simple recipe that is made with pazhaya sadam. After marriage, I learnt another version of killu vadam from my MIL. In this version, boiled rice is soaked in water for two hours, ground smooth adding spices and cooked to make it thick like a koozh. Then it is pinched into small pieces and spread on a paper or cloth. This one tastes so crunchy with melt in mouth texture. But this is a time consuming job when compared with leftover rice killu vathal. 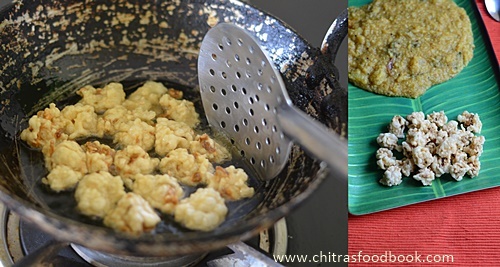 Leftover rice vathal tastes hard when compared with rice vathal. Both the versions has its own advantages and disadvantages. 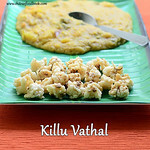 So I have shared both the version of making killu vadam. Choose any as per your liking and try it. But however you make, it would be loved by all. The flavor of onion reminds you onion pakoda while eating. You can enjoy this vadam with sambar sadam, tamarind rice and lemon rice. Ideal for travel. Try it and share your feedback here. 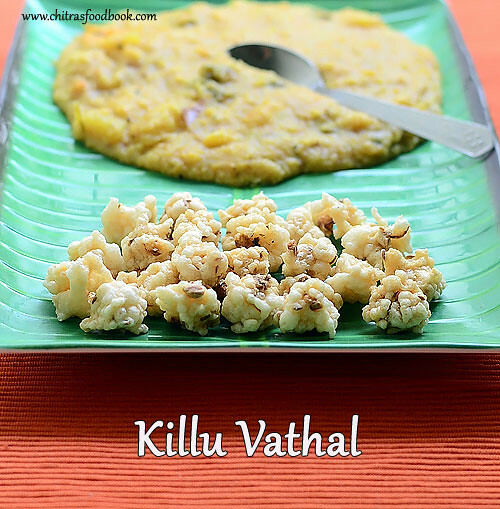 Lets see how to make Killu vadam at home. Check out my other SUMMER RECIPES too. Add water to the leftover rice till it immerses and leave it overnight. The next day morning, take the rice and drain the excess water. Take the rice in a big mixie jar. Add green chillies, hing and salt. Grind to a smooth paste adding very little water if necessary. Add water in a tbsp only if needed. It should come like a thick paste. So do not make it watery. Its the most important point to keep in mind. After grinding the paste,transfer it to a vessel. Chop the onions into small cubes and add to the rice paste. Add cumin seeds.Sprinkle few drops of lemon juice. Mix well and check for salt. Take a cotton cloth or plastic sheet/Polythene sheet. Pinch the rice dough and arrange it in the cloth as shown below. Let it dry under the sun for 3-4 days till it shrinks and change in color. Keep it under the fan during night. Heat oil to deep fry and fry the vadam till it becomes crispy. Deep fry one or two to check whether its dried up completely. If its not chewy and soft inside, vadam is dried. Else sun dry it for another day or two.Fry the vadam till onions turn slightly golden brown. This vadam browns faster as we use cooked rice and onion. So fry in medium flame carefully. Do not burn them. Remove and serve with rice varieties !! Remove and serve as an accompaniment for rice. Wash and soak the rice for 2 hours. Grind it to a smooth paste adding green chillies, hing , salt & enough water. I added 2 cups of water to grind it. ( Actually this batter has to be fermented over night.But I skipped this step and made the batter instantly by adding lemon juice for sourness). Add 3 cups of water in a kadai. Let it roll boil.Add the rice paste and mix well. Add cumin seeds & required salt. Mix well and boil the mixture till it becomes a thick paste. After it becomes a thick paste and leave the sides of pan, add water around the paste and cover the kadai with a lid. Adding water in the sides help to prevent the burnt bottom. Keep the flame low and cover cook the mixture till it changes its color to pale white. After the mixture is cooled down, add lemon juice and chopped onions.Check for taste.Pinch into small pieces by dipping your hands in water.Spread them on a white cloth or polythene sheet. Let it dry for 3-4 days till it shrinks and changes in color. Keep it under the fan during night. Heat oil and deep fry one or two to check whether its dried up completely. If its not chewy and soft inside, vadam is dried. Else sun dry it for another day or two.Remove after the vadam is fried well. Onions should turn slightly golden brown. Do not burn them.Remove and serve with rice varieties !! As I told, method 1 is easy compared with method 2. 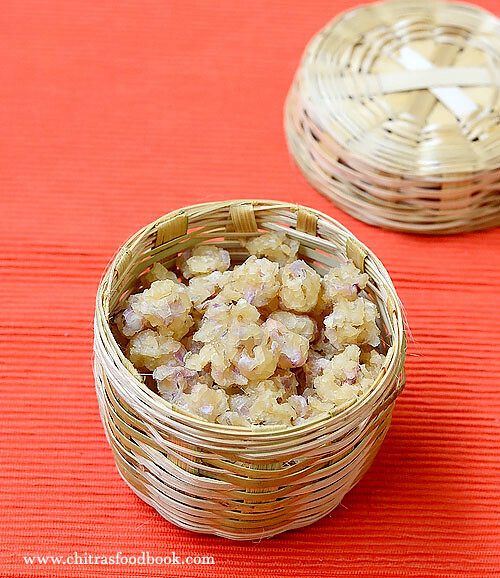 Its ideal for beginners and leftover rice can be used effectively in this summer. In method 2, you can add more water while grinding & cooking the batter. If the batter is too thick, vadam may taste hard. So make the batter slightly thin. 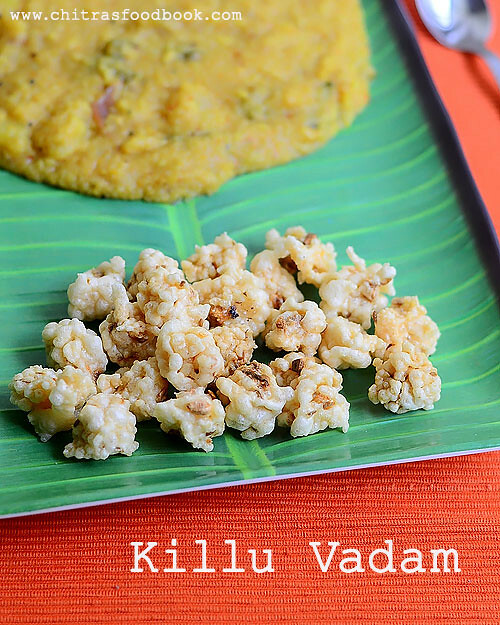 I love to have Killu vadam with Sambar Sadam more than other rice varieties. What’s your choice ?? Tried method 1. Dried for 5 days. When iam deep frying now, it does not increase in size. It just becomes brown. It may be due to insufficient water while making batter. First method uses cooked rice, so it browns faster. Also we are adding onions, so it happens. So try to fry in medium heat by tossing continuously. or is also chewy inside.What could be the problem? Hi, Are you sure its dried well ?. If its not dried completely, it will turn chewy. Dry it for 2 more days. Also keep tossing the vadam till it fries. It helps to prevent browning.